l started quilting over 25 years ago, pushed into it by unforeseen circumstances beyond my control, and found that it was the best thing than ever happened to me, life can take some really peculiar turns sometimes. I had a brain haemorrhage and after recovering found I could no longer see well enough to continue the very fine work of my beloved embroidery, I was bemoaning this fact to my Aunt, who was a patch worker, who promptly gave me a book to read. After leafing through it, without much enthusiasm, I decided I had nothing to lose, so I made a quilt – albeit, not very good and not very artistic, but nevertheless, a quilt. From that moment on, I was hooked, – I then spotted one of the first Patchwork and Quilting magazines and started to receive that every month, what an eye opener, it turned me into a prolific quilt maker, only stumbling on the, to me, tedious quilting, until I discovered a long arm (longarm) quilting system. After much soul searching, and a great deal of encouragement from Matthew and daughter, Alexis, I decided to push the boat out and invest in one of these amazing machines – they really do cost a lot of money, and the only way to recoup this and justify the machine was to start quilting for other people – suddenly, I had found my niche in life. It is such a true saying – as one door closes another opens. If I had not been ill I would not have discovered quilting, or the variety of people I meet who share this obsession, or see the look on their faces when they receive their finished quilts. Before embarking on my new career, Matthew, who is a Chef, and I, ran our own Hotel and Restaurant but now he runs his own 4 star guesthouse in Lochearnhead that is situated in the Trossachs National Park in Scotland, amongst truly beautiful scenery. He only has three en-suite bed rooms and takes a maximum of six people, which he loves, he offers Bed and Breakfast and special breaks, so we find, guests book in for his excellent cooking, bring their quilts and leave a few days later, well rested with a finished quilt. A few years ago a revolutionary computer system swept the world, and after much discussion and even more soul searching I invested in this system. It is called an Intelliquilter, and was installed by Zoltan Kasa, the inventor, who flew over from America to install it. Since the installation my life has been changed completely. I can now do very complicated patterns and motifs, which I could only dream about before. 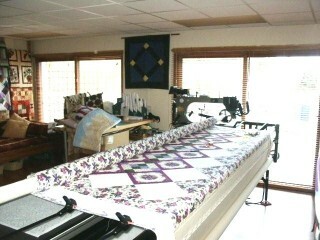 The whole quilting world has been turned on its head and the fascinating part is watching to see where it will go next.